Twenty years ago, Mary Louise Clifford and J. Candace Clifford published Women Who Kept the Lights. With over 38,000 copies in print, they are delighted to introduce a third edition. Since the second edition, published in 2001, Candace has continued to gather lighthouse records in the National Archives, uncovering new material about women keepers and clarifying old. Because we feel strongly that the stories of these remarkable women should be as accurate and complete as possible, supplementary material on a number of women keepers has been added. Two completely new chapters are included: Georgia Stebbins at North Point Light Station in Milwaukee, Wisconsin, and Josephine Freeman at Blackistone Island Light Station in Maryland. The chapter on Margaret Norvell at New Canal Light Station in Louisiana has been much expanded. A few of the sidebars have been revised. Several female keepers have been added to the Appendix and a few deleted after discovering they were either just assistants or served less than a year. Women Who Kept the Lights, ISBN 978-0-9896043, contains 253 pages, 11 maps, 79 illustrations, an Appendix listing officially appointed women keepers, a bibliography, and an index. The list price is $22.95. The publication date is November 1, 2013. Quantity discounts are available. Distributed by Partners Book Distributing. 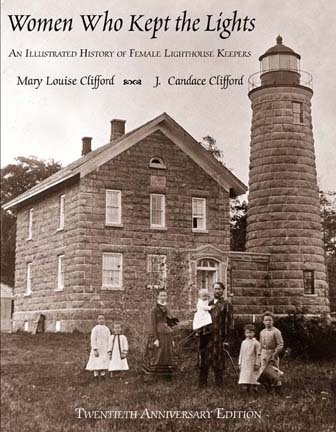 This entry was posted in Books, Lighthouse keepers and tagged J. Candace Clifford, Lighthouse Keepers, Mary Louise Clifford, Women Who Kept the Lights, women's history on October 28, 2013 by lighthousehistory.